To celebrate Jim's birthday, we had plans to take the boat out on Summersville Lake. But, the weather didn't cooperate. So, we had a cookout, presents, and cake at the house. Jim really wanted this shirt..
Making a wish and blowing out the candles. Happy Birthday to the most handsome, thoughtful, loving, and giving man in the whole world. Jim Oiler....you have my whole heart! On the evening of the 4th, instead of going in to town, we decided to set off some fireworks ourselves. I. Love. The. 4th. Of. July!!!! Every since I can remember, I have gone to the Ripley parade. I even took Molli and Morgan just seven days after Maci was born. We get new clothes to wear. We see people we haven't seen for a while, and visit with family in front of Pete's Hotdogs. Anticipating the beginning of the parade. The best place to watch a parade....on your Dad's shoulders. TL cooling off in the pool after the parade. Lots of yummy 4th of July treats. Morgan and Gus came in, from TN, at 4am on Wednesday morning, enjoyed the day, and then left at 8am on Thursday. We were so glad that they came!! We celebrated Maci's birthday by taking the boat out on the river and then coming home and having cake and homemade ice cream. Gabri was here visiting for the weekend and got to celebrate with us. ....a box full of Vera Bradley. Donna Leaptrot baked the cake and then she gave Maci a lesson on how to decorate....it was absolutely, hands down, the best cake ever! Happy Birthday to you, Happy Birthday to you, Happy Birthday dear Maci, Happy Birthday to you! How in the world has it been 18 years since we brought this little, precious, bundle of joy home from the hospital? To celebrate Maci's 18th Birthday, she wanted to spend the day on the river. Tyler and Molli took their boat, and we (Tyler, Molli, Jim, myself, Maci, and Gabri) had a cookout and spent the day enjoying ourselves on the river. Jim and Tyler getting the grill ready. Maci and Gabri...the 18 year olds! He's a wild man....the sign clearly says, "Stay inside the gate when boat is in motion." Maci and Molli. Couldn't they pass as twins? The sweethearts, Molli and Tyler. Jim and Tyler are definitely the wild ones. We had a GREAT time. It was so nice to be out on the river, not a care in the world, enjoying each other and the sun. We sure missed Morgan and Gus though! Thanks so much Tyler and Molli! Can't wait till the next time! I Love my life! God has blessed me with my family. I am married to my high school sweetheart, Jim. We are the parents of three wonderful daughters. 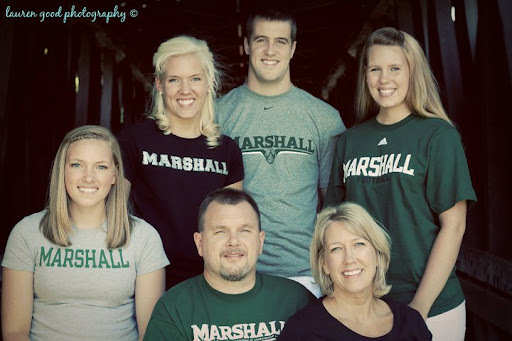 Molli Michael Markham, RN, BSN is a recent graduate of Marshall University. Morgan Faith is a fifth year student at the University of Tennessee. Maci James is a freshman at West Liberty University. And our son-in-law, Tyler is the owner of Wild and Wonderful Productions. I work in the banking industry. I love my Lord and strive to do His will each and every day. Introducing the Simplified Teacher Planner!